IÂ´m on a train from Rome to Paciano, and my mis­sion today is sim­ple. 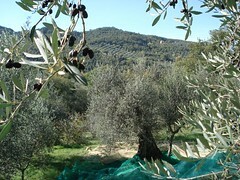 IÂ´m going to pick some olives. Today’s jour­ney is a tiny frac­tal image of a larg­er one I took from 1989–1995. Yes­ter­day, I spent the day in a meet­ing in a tiny office in Rome. Our sub­ject was the revi­sion of the bylaws of Green­peace Italy. I was there sev­en­teen years ago when we wrote the first set of bylaws, and Sid­ney Holt, Mau­ril­lio Cip­parone, Pietro Dohrn, and David McTag­gart set off to get an impec­ca­bly dressed Notary to put as many wax seals and offi­cial stamps as pos­si­ble on the piece of paper. We had no clue what it actu­al­ly took to offi­cial­ly reg­is­ter a non-prof­it orga­ni­za­tion like Green­peace under the Ital­ian legal sys­tem. The real process would take ten years. But in the mean­time, that piece of paper, on account of hav­ing had many wax seals and offi­cial stamps applied by an impec­ca­bly dressed Notary, allowed us to rent an office at Man­lio Gel­so­mini 28, set up a bank account, raise funds, and all the rest. In Italy, itÂ´s all about pre­sen­ta­tion. Had the Notary not been impec­ca­bly dressed, weÂ´d have been boot­ed out in a week. I worked in Rome for three years. David McTag­gart was the chair­man of Green­peace Inter­na­tion­al at the time. I was his assistant/speech writer/technical support/factotum. I was also his inter­preter, both in Ital­ian and his native, but some­times incom­pre­hen­si­bly idio­syn­crat­ic, Eng­lish. We worked in a sep­a­rate room in the back of the office, and DavidÂ´s no-non­sense style kept most of the Ital­ian vol­un­teers and staff at a respect­ful, some­times fear­ful dis­tance. He had, shall we say, a tem­per. One day, one of the Ital­ian vol­un­teers, the Leonine Domi­t­il­la, sim­ply wan­dered into that inner sanc­tum and start­ed strolling around, pick­ing things up off of desks, doing a self-con­fi­dent perusal, like a cat inspect­ing a new room. Domi turned out to be the type of per­son Green­peace was built on in those days: pas­sion­ate, high-ener­gy, a fast learn­er and capa­ble across a range of skills. She estab­lished a rep­u­ta­tion for fear­less­ness in her polit­i­cal work, where sheÂ´d kit­ten her way to the atten­tion of bored and aging white male del­e­gates at var­i­ous inter­na­tion­al fora, then bring out the big claws if they mum­bled or tried to wrig­gle out of doing the right thing. She went on to become Exec­u­tive Direc­tor of Green­peace Italy. Today, IÂ´m going to spend a morn­ing pick­ing olives with her in Paciano on the farm she inherit­ed from David McTag­gart when he died in 2000. The farm was a bit of an acci­dent. In the ear­ly days of the 1990s, McTag­gart was con­tem­plat­ing retire­ment and look­ing for a house in the Ital­ian coun­tryside. He quizzed every Ital­ian in the office with a din­ner-par­ty game in which he asked them if they could live any­where in the world, where it would be. HeÂ´d then shoot down every choice they made. HeÂ´d prob­a­bly lived in or spent sig­nif­i­cant time in a cou­ple dozen coun­tries in his life, so he gen­er­al­ly knew where­of he spoke. But his com­bat­ive din­ner con­ver­sa­tion­al style, in which he good natured­ly asked your opin­ion and then tried to bul­ly you around to his own didnÂ´t set well with every­one. His real infor­ma­tion objec­tive was to ask the natives if they could live any­where in Italy, where it would be. He inves­ti­gat­ed beach hous­es in Sabau­dia, Moun­tain hous­es in the Abruzzi. But a lot of answers clus­tered around Tuscany/Umbria. He appoint­ed Domi his offi­cial house hunt­ing com­pan­ion. They roamed the coun­tryside on week­ends look­ing for places, and, inevitably, fell into a rela­tion­ship which would even­tu­al­ly pro­duce George, DavidÂ´s only son. When David found his house, it was a roof­less wreck nes­tled away on a dirt road amid the rolling hills of Umbria. Just what he was look­ing for. Unfor­tu­nate­ly, it sat on a wreck of an olive farm which the own­er wouldnÂ´t sep­a­rate from the house. David knew noth­ing about olives. He didnÂ´t even like olives. But that was the deal if he want­ed the house. He took it. In 1991 David retired as active chair of Green­peace Inter­na­tion­al. He was grant­ed an hon­orary posi­tion with some advi­so­ry func­tions, and bud­get for an assis­tant. He offered me a job com­bin­ing that role, help with his own foun­da­tion work, help super­vis­ing the recon­struc­tion of the oth­er prop­er­ty on his land, and the admin­is­tra­tion of the olive farm. I took it. And this was the train that Martha and I rode from Rome to Paciano with our two cats and our belong­ings, to begin what would be a three year stint among the olive groves. The olive har­vest was always the turn­ing point of the year, the time when all the yearÂ´s work lit­er­al­ly bore fruit, when all of us would drop what­ev­er we were doing to get up at dawn, work until sun­set, for three weeks straight with­out a break. Until my sons were born, it was the only excuse I had as an adult to climb trees. thank you for your stats on olive olive harvest.have become proud own­er of 150–200 olive trees.to b brought back into pro­duc­tion in Cat­alo­nia Spain.am retir­ing to the moun­tians [not that i have a pension]with my pony and dogs to organ­i­cal­ly farm a large finca,and am try­ing to acquire some knowl­edge of olives before i go,as i prop wont have inter.webs once there.apart from active protest­ing [way back in the day start­ing with help­ing Obie set up first free Windsor.yar yar yar]my skills are plant breed­ing and equestrian.i shall organ­i­cal­ly farm the land and hope to do some species con­ser­va­tion work.i have found a lot of imfor­ma­tion online but yours r the first stats on on weights and work hours. thank you more infor­ma­tion i have the more courage i feel so God­dess bless you and yours. i come from china,our fac­to­ry is pro­fes­sion­al pro­duce gar­den tools,include olive harvest,could you help me tosell it in you country.our pro­duct have CE cer­tifi­cate. drop me an email at bri­an­fit58 at gmail dot com and I can put you in touch with some­one who would love to have a vol­un­teer in exchange for a place to stay and meals, if that’s inter­est­ing. There’s no place I know of that will pay any­thing mean­ing­ful for this work any­more, and when they do they’ll tend to hire squads of skilled migrants. Anoth­er pos­si­bil­i­ty is to pick with for Olives for Peace, a Joint ven­ture between Israelis and Pales­tini­ans who are build­ing coop­er­a­tion around olive farms.Â Sounds good to me as well — pick­ing olives as an act of peace work. My son, l8, is real­ly inter­est­ed in pick­ing olives this autumn and a job which he was promised has fal­l­en through. Could you give us some advice on where to go to pick olives? Is Peru­gia the cen­tre of the uni­verse in this depart­ment!!! No idea IÂ´m afraid, Kur­sad. I’ve seen two kinds of olive pick­ing machi­nes, one that shakes the tree, the oth­er as I’ve described above that combs the branch­es. I’ve nev­er picked a nut in my life, so can’t say if either of the­se meth­ods would work. My name is Kur­sad Haci­hamza­oglu, i am writ­ing from Turkey. I am inter­st­ing in olive pick­ing machi­nes. Actu­al­ly we grow nut in black sea region of Turkey. We are look­ing for a machine for pick­ing nuts. Do olive pick­ing machi­nes work for nut pick­ing? or Do u have anoth­er machine for that. Thanks in advance for your help. Next Next post: How many olives to make a bottle of oil?